Director of Sport Christopher Jones addressing the veterans and junior cyclists in the presence of Mayor Gifford Marshall and GCF President Horace Burrowes (partly hidden) before the start of the BCC. Director of Sports Christopher Jones has expressed immense satisfaction following the successful hosting of the historic and inaugural Bartica Cycling Challenge (BCC) on Saturday last, organised by the Guyana Cycling Federation (GCF) in partnership with the Bartica Town Council. 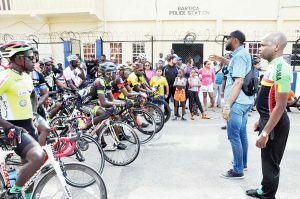 Over 60 of the nation’s best cyclists along with dozens of youths from the Bartica community combined to showcase their skills in a competitive atmosphere witnessed by hundreds of Barticians as well as others from Berbice, Linden and Georgetown. A satisfying day was had by all with Jones, who also made the trek by speedboat ride lasting for just about one hour from Parika, to be a part of history. He said that both Mayor Marshall and President Burrowes ought to be commended for a well organised and put together event. Commending the initiative and investment that would have been made by the Town Council, Municipality, Business Community and the GCF, Jones stated that it’s a great start moving into the direction in which they would like to see sports moving. DoS Jones took the opportunity to interact with residents along the route which was strategically mapped out to ensure community involvement. He shared that they are already looking forward to the next event. He reasoned that the municipalities, Neighbourhood Democratic Councils and Regional Democratic Councils have to take sports in their respective areas seriously. “It boosts tourism, it gets your young people engaged in sports activities, it gets your community engaged in activities and it all feeds into the government’s thrust for bringing about social cohesion. 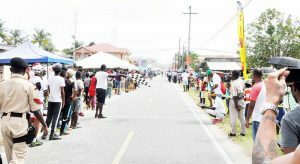 Fans seen on both sides of the street approaching the finish line on Second Avenue, Bartica for the historic event. Jones noted that he is hopeful that the other Municipalities, NDC’s and RDC’s take note of what the Municipality of Bartica has accomplished, what the GCF has done and seek to develop their respective areas from a sports perspective also. Dozens of the senior citizens of Bartica also came out to be a part of the action with many spending the entire day to soak in all the action; this did not escape the eyes of Jones who said it was great to see that. The DoS stated that any other Municipality that takes up the challenge to follow suit, the National Sports Commission would be on board to assist.